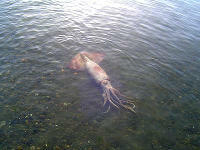 Giant Cannibal Squid: The Invasion Has Begun! Now Bruce Deagle of the University of Tasmania, Australia, and his team have analysed the gut contents of a male giant squid caught by fishermen off the west coast of Tasmania in 1999. 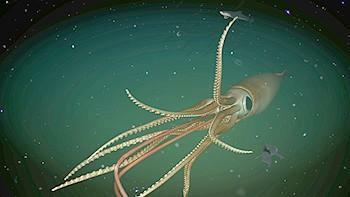 Among the slurry of macerated prey, they found three tentacle fragments and 12 squid beaks. 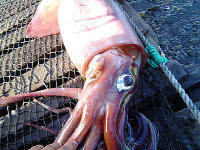 The beaks could not be unequivocally identified, but all of the squid DNA in the slurry, and the tentacle fragments, was found to be that of A. dux (Journal of Heredity, vol 96, p 417). “This strongly suggests cannibalism,” says team member Simon Jarman of the Australian Antarctic Division in Kingston, Tasmania. The only other prey species identified was a fish, the blue grenadier. 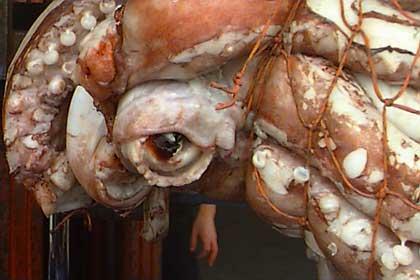 I was looking forward to our squid overlords but if they are going to be biting penises, er, phalluses off I’m going to have to rethink that! It looks like Republicans have learned a new trick in the media. If you give exclusive stories to journalists with the condition that no Democrats are to be allowed to comment on the story, journalists think that’s a perfectly acceptable thing to do. Not only that, but they won’t even bother to do any additional research for the story. Go here and here for more. Under a purported embargo, which the Post said prevented reporters from revealing the administration’s decision until midnight — “too late” to contact Democrats for a response — staff writers Peter Baker and Charles Babington quoted anonymous White House officials spinning the decision regarding the documents(emphasis mine – afarensis). But while other contemporaneous print media reports noted Democrats’ previously stated arguments for full disclosure of the documents, the Post omitted them for the second day in a row. Turns out Roll Call writer Lauren Whittington got the story from the GOP with the ground rule that she not call anyone else for the story. After reading this article I couldn’t help but ask myself which media outlets in West Virginia were going to be running these advertisements. I called up Lauren W. Whittington (columnist for the Roll Call) to ask her if Brian Nick went into any specifics pertaining to his comment that stated: “The initial buy, which will be concentrated in the large media markets in the state.” I was interested in finding out, in specific, which television stations or “large media markets” Brian Nick was referring too. Whittington told me that Nick did not go into any specifics other than what she had presented in the article for “security reasons,” security as in they do not want Democratic operatives finding out this type of information. Days after financial services giant Morgan Stanley informed print publications that its ads must be automatically pulled from any edition containing “objectionable editorial coverage,” global energy giant BP has adopted a similar press strategy. According to a copy of a memo on the letterhead of BP’s media-buying agency, WPP Group’s MindShare, the global marketer has adopted a zero-tolerance policy toward negative editorial coverage. Another magazine executive who had not heard about BP’s policy or of Morgan Stanley’s said his company has unwritten guidelines with advertisers from several industries, including auto, airlines and tobacco, to pull their ads if related negative stories are in the issue. These cases, the executive said, occur more with news magazines than lifestyle ones. Go here and here for more info. Comforting the afflicted and afflicting the comfortable indeed! That growth pattern turned out to be highly unusual. 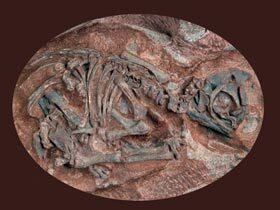 The hatchling had a huge head and forelimbs as long as its hind legs. As the animal grew, its neck stretched dramatically, while its head got increasingly smaller relative to its body. Its hind legs grew more than twice as long as its forelimbs. An adult Massospondylus had a head that was only 8 inches (20 centimeters) long. Its upper limbs were only half the size of its thighbones. It grew to be about 16 feet (5 meters) long, with a beanstalk-like neck and an 8-foot (2.4-meter) tail. The earliest sauropods may have also developed with quadrupedal proportions, like their Massospondylus cousins. But these early sauropods retained their four-footed stance into adulthood. The growth pattern of the Massospondylus could therefore provide clues about how the giant sauropods evolved. “These animals are essentially predecessors to those large sauropods,” Reisz said. No, I have not gone and got myself all religified. I’m still the same cynical smartass who thinks we are descended from monkeys! You see, I have realized I have done wrong – that is I have spelled a bloggers name wrong. I am refering, of course, to evolgen. I had been spelling it Evolgen, but apparently this is incorrect, so I have corrected it in my blogroll. I am particularly apalled since a lot of people mispell my name (it’s “afarensis” not Afarensis – let’s be taxonomically correct) and here I go and do the same darn thing to another blogger. I have written several posts on this before. They can be found here and here. TOPS then explicitly rejects several implications of Darwinian evolution. of random processes, so it is a waste of time to inquire into their functions. Using sophisticated computer software to align and compare the mammals’ genetic material, or genomes, the team determined that chromosomes tend to break in the same places as species evolve, resulting in rearrangements of their DNA. Prior to the discovery of these breakage hotspots, the prevailing view among scientists was that such rearrangements occurred at random locations. In their paper, researchers report that the chromosomal abnormalities most frequently associated with human cancer are far more likely to occur in or near the evolutionary breakage hotspots than were less common types of cancer-associated abnormalities. Researchers theorize that the rearrangements seen near breakage hotspots may activate genes that trigger cancer and/or inactivate genes that normally suppress cancer. However, they emphasize that far more work remains to be done to clarify the relationship between cancer and the breakage hotspots. One thing researchers have determined is that the regions immediately flanking the breakage hotspots contain more genes, on average, than the rest of the genome. Centrosomes that are too numerous or too large would produce too strong a polar ejection force, damaging chromosomes and leading to chromosomal instability. As Wells tried to argue. “Science tells us that the most effective tool we currently have to understand our own genome is to compare it with the genomes of other organisms. With each new genome that we sequence, we move closer to filling the gaps in our knowledge,” said Dr. Ostrander, who is chief of the Cancer Genetics Branch in NHGRI’s Division of Intramural Research. The multi-species comparison published in Science also yielded surprising results about the rate at which chromosomal evolution occurs. Based on an analysis that included a computer-generated reconstruction of the genomes of long-extinct mammals, researchers found the rate of chromosomal evolution among mammals dramatically accelerated following the extinction of the dinosaurs about 65 million years ago. Before the sudden demise of dinosaurs and many other types of animals, which is thought to have resulted from a massive comet or asteroid striking Earth, mammals shared fairly similar body plans and also fairly similar genomes. Researchers speculate that the mass extinction opened new ecological niches for mammals, spurring their diversification and the emergence of new mammalian orders. This situation would have facilitated opportunities for the isolation of mammals into more distinct breeding groups, speeding the development of species-specific chromosomes. “This study has revealed many hidden secrets on the nature and timing of genome evolution in mammals, and it demonstrates how the study of basic evolutionary processes can lead to new insights into the origin of human diseases,” said Dr. Lewin, who is director of the Institute of Genomic Biology at the University of Illinois. Once again proving that nothing in biology makes sense without evolution and incidentally proving wrong, yet agian, those who say evolution has nothing to offer the field of medicine. This is absolutely despicable. Yet, the mainstream media keeps wondering why people are abandoning them in droves. It concerns a missing pregnant woman from Philadelphia. CRAMER: I think we got to focus on this ratings issue for a second, because I don’t think people—we all—we all understand this because we’re in the business. I didn’t get. If you can get a huge number of people watching a particular story, it gives you the license to do a lot of other stories. Now, some people abuse the license by going to Aruba every single night, as far as I’m concerned. But I have to—I—I—I love programing that gets watched. CRAMER: So, I’m not going to damn this kind of story. MADDOW: But it’s the per—again, it’s the perception. We’ve got a woman who has been missing for nine days. She’s pregnant. She’s a young mother. It has all the components of the other stories that get covered. But because of the race, because she’s from West Philly, it’s not getting covered. CRAMER: I know that area. So a white woman disappears in Aruba and the Mainstream Media loves it cause it brings great ratings and black woman (forgot to mention that) disappears and it is cause for laughter.